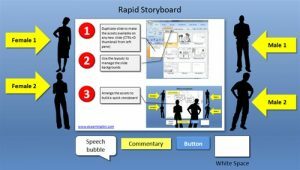 We’ve included a free rapid storyboard that you can use to build a quick mockup of a character-based eLearning course. Storyboards have been helping developers build training and eLearning courses for decades. Our free rapid storyboard below is meant to allow you to quickly mock up a course in PowerPoint to get buy in before beginning your design. If you click on the image of the storyboard below, you’ll find the download links and a youtube video highlighting how you can use the storyboard. Enjoy!